The black-finished Aluminum Studio Stand from Kupo is packed with highly useful features for the set or studio. The 3-section, spring-cushioned stand rises to a maximum height of 9.7' and can support gear weighing up to 33 lb. The legs have a wide 39.37" footprint for balance and stability, and fold down to 49.6" for storage and transport. A special feature of the stand is a "lazy leg" which can extend up to 4.7" to center the weight and compensate for uneven surfaces. 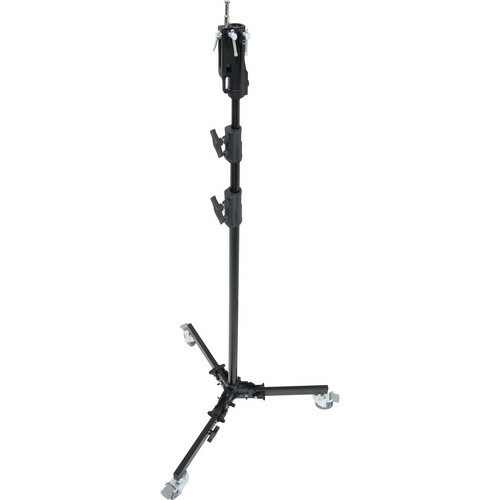 The stand also has a combination 1 1/8" Junior receiver to 5/8" retractable Baby pin for mounting versatility, and braking wheels for mobility.